How many of you have made New Year’s Resolutions about eating healthier, losing weight, and taking care of your body? You’re in luck! Today’s Try It Tuesday will help you on your way to wellness! 1 cup also has vital vitamins such as: A, B-6, thiamin, riboflavin, niacin, folate, pantothenic acid and vitamin K! Plus, its very low calorie and low carb! One cup has only 42 calories and 10 carbs! 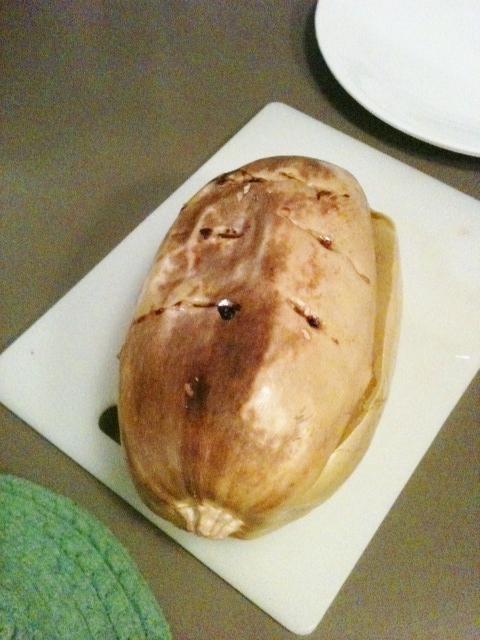 First, puncture the squash and put in the microwave for about five minutes. 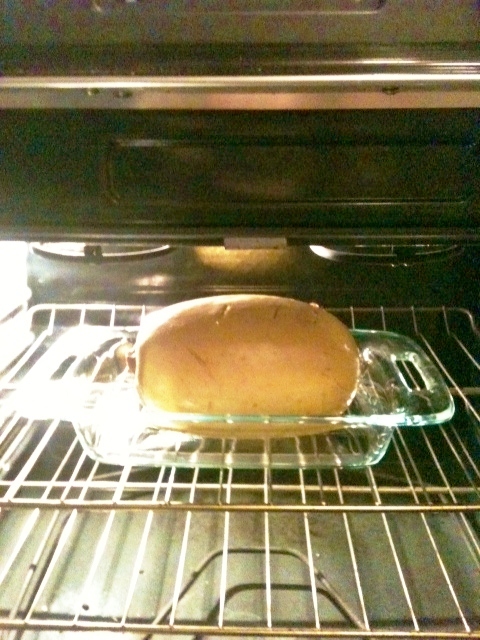 After that, put it in the oven at 400o and bake for about an hour. Please do not look at my dirty oven. When its done, it may look like this (unless you aren’t like me and don’t let the top of your squash touch the heating element in your oven). Cut the squash open, long-ways. Its like a yellow pumpkin. After you remove the seeds, twist or scrape a fork on the inside and pull out the “noodles”. You should get a fair amount. Huff the Hubs and I had a lot leftover. Then, serve with your favorite sauce! I served spaghetti squash with Newman’s Own Marinara and Italian chicken. It was SO tasty! And filling too! I’ve got some leftover, so I’m set for lunch tomorrow! Woohoo! 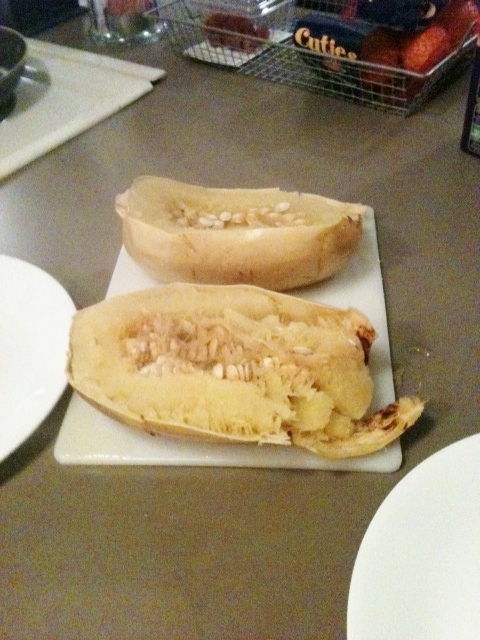 This entry was posted in Uncategorized and tagged healthy eating, recipe, spaghetti squash, Try It Tuesday by huffmanpost. Bookmark the permalink. Ha ha! It does! 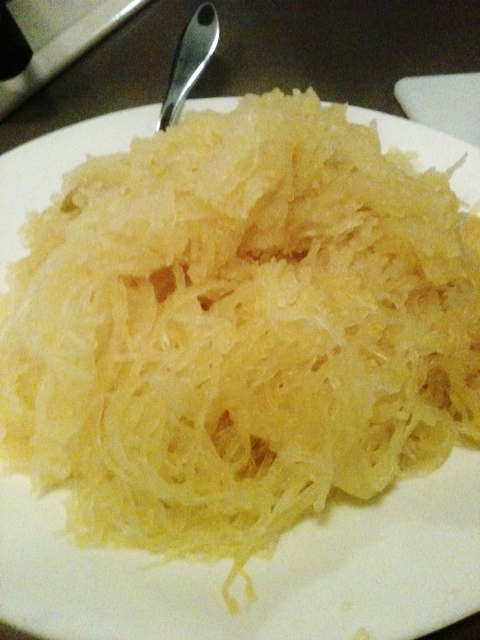 But, trust me, its sooooooooooooooooo much better than sauerkraut!